These are 3 bedroomed houses that sleep 5. Master double room with ensuite, 1 double room and 1 single. Features Colour TV Kitchen including microwave, dishwasher, washing machine/dryer. Bed linen and duvets provided. Beds are made upon arrival. Cots are available on request. Private car parking. Keel, the main village on the island is less than 10 minutes drive from the cottages and boasts a beautiful beach, local pubs and a restaurant along with various water sports and golf. 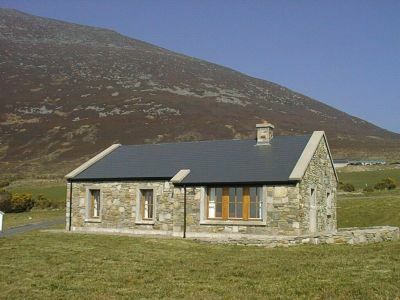 These detached cottages command glorious panoramic views over Keel bay and the rugged countryside. From Shannon: Take N18 to Clarinbridge via Ennis, N6 to Galway, N84 to Ballyhean via Ballinrobe, N5 to Castlebar, N59 to Mulrany, R319 to Keel via Achill Sound. From Dublin: N4 to Edgeworthstown, at Longford bypass roundabout take 2nd exit into bypass. N5 to Castlebar, N59 to Mulrany, R319 to Dugort via Achill Sound. In Achill; Go through the Island, take a right after Pub called the Cross Roads Inn. Take a right and follow the road to the T- Junction and turn right. There is a concealed enterance 200yds on the Left.